A group of Malaysian lawyers demanding affirmative action for the country's ethnic Indians vowed on Friday to sue top police and legal officials who claimed it had ties to terrorists. Malaysia has tried to paint the group, the Hindu Rights Action Force, or Hindraf, in terrorist colours after it organised a rare protest by 10,000 ethnic Indians last month. Malaysia's police chief said it was trying to provoke racial clashes. But Hindraf dismissed the accusation as ridiculous, saying it was pursuing its objectives by legal, peaceful means. "They're bankrupt of ideas to punish us," the group's legal adviser, P Uthayakumar, told Reuters. "They've no more bullets to fire so they're firing this at us. It's like killing a fly with a sledgehammer, because we're so small." Multi-racial Malaysia has brushed aside claims that it has mistreated its ethnic Indians, saying they are better off than those still at home. But ethnic Indians, who make up about 7 percent of a population of roughly 26 million, complain of a lack of educational and business opportunities, saying government affirmative-action policies that favour majority ethnic Malays have marginalised them. November's protest also upset authorities because it followed a much larger opposition-sponsored rally seeking electoral reform in Malaysia, where such gatherings are unusual because police clamp down tightly on them. Police chief Musa Hassan this week accused Hindraf of seeking assistance from terrorist groups. "Of late there have been indications that Hindraf is trying to seek support and help from terrorist groups," Musa told state news agency Bernama late on Thursday. "The police are concerned over Hindraf's activities and will not hesitate to take harsh action to guarantee the nation's peace and security." Police intelligence and monitoring since July 28 showed that the group had fanned racial sentiment among Malaysia's ethnic Indians by stirring up their anger and rousing hatred against the government, Musa added. "Their actions are potentially explosive in sparking racial clashes," he told Bernama in a statement. Uthayakumar said Musa's remarks echoed courtroom comments by Attorney-General Abdul Gani Patail linking the group to Sri Lanka's Tamil Tiger rebels, and dared both officials to produce evidence of their claims. "Technically,what they said is slander and criminal defamation," he said. "I'm going to file a civil suit against the attorney-general and the chief of police, because then they will be forced to produce the evidence in court." Opposition leader Lim Kit Siang said the police chief's accusation showed the government was escalating its position of denial. "It will be Malaysia's misfortune and tragedy if the government's sole concern is to indiscriminately demonise the Hindraf leaders," Lim, head of the Chinese-dominated Democratic Action Party, said in a statement. 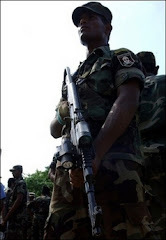 Sri Lanka's Liberation Tigers of Tamil Eelam (LTTE) have unleashed a nearly 25-year-old civil war on the Indian Ocean island in their battle for an independent state there.